Glenn Platt ​(@glennplatt) is the C. Michael Armstrong Professor of Network Technology & Management & Director of Interactive Media Studies at Miami University​​. He is interested in social media marketing, digital media and e-Commerce​​. He is also the faculty ​sponsor of the	Esports team at Miami. Click to display or to hide the script from Episode 47. Rosemary Pennington: It's holiday shopping season, which means that advertisements are even more pervasive than usual. Digital ads, in particular, seem to be everywhere. Whether they pop up while you're watching YouTube videos, checking your Fantasy Football team, or just appear in your Twitter Timeline, someone somewhere is trying to sell you something online. And they often rely on data you leave behind while browsing the web, in order to capture your attention. Digital marketing and the data behind it is the focus of this episode of Stats and Stories. Stats and Stories is a partnership between Miami University's Departments of Statistics, as well as University's Departments of Media, Journalism, and Film, as well as the American Statistical Association. I'm Rosemary Pennington. Joining me in the studio: our regular panelist John Bailer, Chair of Miami's Statistics Department, and Richard Campbell, Chair of Media, Journalism and Film. Today's guest is Miami University's Glenn Platt. Platt is a Professor of Marketing and the C. Michael Armstrong Chair at Miami. He also serves as the Director of the Armstrong Institute of Foreign Directive Media Studies. Thanks for being here today Glenn. Glenn Platt : Thank you. Pennington : I know you teach some classes at Miami, on Social Media, Marketing, and Digital Marketing. How did these become areas of interest for you? Platt : You know, in some sense, digital marketing is kind of eating the world. I'm trying to remember who initially said that, I can't take credit for that, but the phrase has kind of found its way around, where, you know, there was a time in which we could talk about digital marketing as if it was separate from the billboards. You watch your television marketing, and these days all those things have become integrated. It's this singular piece that sort of binds it all, right? And so, whether it's buying a Twitter ad that's tied to a particular television show, and, so you only see it in Twitter when that show is playing, or knowing that you're travelling past a billboard and now Waze for example, kind of gives you, basically virtual billboards on yours Waze app, and so you know, in some sense, it wasn't as much a decision to move to digital marketing, as the recognition that it was simply all there was at this point. Bailer : So, when were the first digital marketing campaigns started? Platt : That's an excellent question. As early as there was sort of a commercial Internet, and sort of the post-ARPA era in which there were websites that brands could put up, and you know, use as promotional vehicles, digital marketing in some sense existed. But, as kind of focused campaigns, there were definitely there were some key turning points in the digital marketing history. So, some of the campaigns, we like to talk about our class like the seminal campaigns. Um Burger King had a campaign really early on Facebook, if you unfriended 10 people it would give you a free Burger King coupon for a burger and then it would send those ten people a message saying, "Richard Campbell unfriended you for a burger" right? And so, it was viral by nature, it would go to ten people… you know the math of it was really clear, but it also kind of got at this interesting philosophical question of "what does it mean to really have a friend on Facebook?" And still was consistent with the brand. And so, they got, actually, Facebook banned that particular campaign, it was around for about a week or two, and then they kicked it off. So, really early experiments like that were where companies were trying to leverage the technology to do something that hadn't been done before. I mean, that's what makes digital marketing unique, that's when you're effective in it, not when you're replicating what had been done. The banner ad. You know which you are more likely to survive a plane crash, statistically, than to click on a banner ad. Just so you know the numbers here, it does not happen very often, but instead are able to kind of capture the energy of the social space, and then use it to help amplify what your brand is about, which is what Burger King was trying to do in that campaign. Richard Campbell : Glenn, you talk about markets as conversations. Can you talk a little bit about what that means? Platt : Yeah, you know that phrase, when we talk about the history of digital marketing, that phrase comes from one of the seminal pieces about digital marketing, which called the Cluetrain Manifesto. It was this, it's a fabulous book, which you can now find online for free, legally, I want to say, and that was the Cluetrain Manifesto. The first line in the manifesto is that "markets are conversations" and it was this recognition that what digital and social spaces are by nature, communities. In fact, when I talk with my students about digital, you know I tell them the title of the class is Digital Marketing, but really the title of the class should be "Online Community Management", that's your job. Your job is to manage a community of people, who have some shared interest and stop thinking about markets as places of sort of transactional exchange, but rather platforms for people who have shared interests, to engage in their love of Necco Wafers, or whatever it is that they… There's a saying that like if you think you're one in a million people, there is over three-thousand people like you on the Internet. You know, the sense of community is built into it, right? And so, what we want to do is not think about the relationships between brands and customers as transactional, but rather participating in some sort of shared conversation. Bailer : So, can you tell us what are some of the components of a digital market campaign? Platt: A digital marketing campaign… I'm going to give you a non-answer to that, that's a classic professor move, So, the non-answer to that is I think the best digital marketing campaigns area actually not campaigns at all. And so, the story that I gave you about Burger King is a great story, right? Or we could talk about you know the Old Spice guy, and everyone's got these, you know there are these very focused examples of a thing that happened at a moment in time, but a true digital marketing campaign is really about managing an ongoing set of conversations. So let's say were talking about the Cleveland Browns, and we want to have we want to talk about "What is a good marketing campaign for the Cleveland Browns? It won't be about a single tweet that you do that's really clever, its going to be about finding people who love the Cleveland Browns, and giving them a platform to have a conversation around it, you know, using Periscope to have behind-the-scenes tours with the general manager, and using Snapchat to capture special filters for the ultra-fans that are sitting in the best seats, and so they can share images with each other. You're kind of creating a petri dish. A digital campaign is a petri dish, more than a single act. The single acts are great stories, but- My favorite at the moment is, have you seen the…what was going on with Kentucky Fried Chicken's Twitter followers? Wasn't that fantastic? So, I think a marketing agency guy realized this and Tweets this. He's like, "hey I just noticed that KFC only has eleven followers", or is "only following eleven accounts on Twitter, take a look at them". And you go, and you look at them and the first five of them are, the each individually, The Spice Girls. And the rest all have the first name "Herb". And so, its "eleven herbs and spices". And everyone laughs and thinks that's awesome, which it is, it's totally awesome. And then KFC, as an aside commissioned a painting for this guy of him riding on the back of the Colonel, and I mean, there's a whole story with that, and that makes for a great conversation, like this around a podcast. That's not going to sell Kentucky Fried Chicken. What's going to ultimately sell Kentucky Fried Chicken is for the people who love the eleven herbs and spices, and want to replicate them at home, and travel great distances, and are upset about the cancellation of a particular type of sauce packet, and want to talk about that. Managing those people, that's a brilliant digital campaign. The eleven herbs and spices are clever, but at the end of the day that's not a campaign, that's publicity and those are different things. Pennington : You bring up the sauces, which reminds me of the Rick and Morty, Donald's tie-in with the Schezuan sauce. So, could you maybe talk a little bit about that and then sort of explain where you think that campaign, what it did right and maybe what it did wrong? Campbell : First, tell him who Rick and Morty are. Pennington : I think Glenn could probably explain who Rick and Morty are. Platt : So, Rick and Morty is sort of an alternative cartoon? Uh is probably the best way to think about it. It's on Cartoon Network, right? Platt Yeah. Lots of, sort of, alternate reality, you know? Quantum physics kind of stuff, and it engenders pretty strong feelings, one way or the other, right? Pennington : Yeah, pretty strong fandom. Campbell : And our students are really into it, I found a lot of them, among my students. Platt : They are, and I mean it's a clever show, I mean it is funny show. And there was a… So, McDonald's had a one-day event where they were going to have this sauce. I think Rick was a big fan, and so, they only had it for this one day, and they ran out. Like, the demand was so high that they ran out. And people went, like, they went nuts. Yeah, right? They just totally went nuts, and it backfired completely because they were angry, and they took it out on McDonald's… And it's a great example, I think, even of the point I was trying to make, like, campaigns run that risk, because they're stunts. Like McDonald's famously, I don't know, was maybe like four or five years ago, had, it was a "McDonald's Moments", I think was their tagline at the time. And so, they did this hashtag. Like, tell us your McDonald's moments, right? You can imagine how that would go. Lots of bathroom related McDonald's moments, and you know because they didn't really think through how people were going to co-opt it. And Coca Cola had a Twitter bot, that people tricked, essentially, into Tweeting out Mein Kampf. Or, you know, that because you're almost kind of throwing out the gauntlet to say "Hey, screw with me", right? Because we think were clever with this campaign, and the Internet always like to think it's more clever than you are. And so, you know, that is why I think that is a risky proposition, this campaign, because you think you're doing something really cool, but inevitably there's some mechanism that someone can screw with you. So, focusing more on helping people and amplifying as opposed to highlighting. Pennington : You're listening to Stats and Stories, where we discuss the statistics behind the stories and the stories behind the statistics. The topic today is digital marketing. I'm Rosemary Pennington. Our special guest is Glenn Platt, from Miami University, a Marketing Professor here. So, Glenn, you were talking a bit about the Schezuan sauce, and how that played out in social media, and I have a question about some of these particularly Twitter accounts where they get kind of feisty with their followers. So, Denny's is very famous for kind of having this tongue-in-cheek approach to how they interact with their audience, in a way that is playful, and sort of pokes fun of themselves, and other people but also Chipotle had that huge meltdown where they had the pretend takeover of the account, and the person was Tweeting out all of this terrible stuff. And they had to back pedal from that, apologize. So, if someone is trying to create a digital media campaign, and this issue of authenticity, kind of is what you were circling at, what do they need to be thinking about if they're going to create a campaign that meaningfully engages an audience? Platt : You know what? The first day of class, in my Social Media Marketing class, I tell them why I love digital marketing and, the worst thing about marketers is like the "madmen" vision. This idea there's this group of people sitting around the room, and they're going to convince you that if you just smoke cigarettes you're going to get laid, right? That somehow, there's some magical things that are out there, and its about obfuscation, and don't look at this and don't look at that. And the beautiful thing about the Internet, is the Internet susses out that immediately. The Internet has very little tolerance for people that are not authentic, and are not true. And that goes for facts, as well as voice. And so, the job of a digital marketer is to speak in that voice, and instead of trying to convince someone that if they just bought your product that their lives' problems are going to be solved, that "look this is the best thing about this product and were going to tell you about the best thing". It is in some sense, the essence of being truthful. Like, what's the old saying "the good thing about being honest is that you never have to remember your story". That's kind of your gig. You're not trying to remember a story here. You're just trying to be true to who you are, and that means Denny's, or Wendy's is another example, where the brand, if you took that exact same person who's brilliant behind the Wendy's Twitter account, and you put them behind Burberry, right? Or Harvard or something like that it would be a disaster, because that's not who they are, that's the voice. And so, by figuring out what is your brands voice, what would they sound like if they were a person what would they look like how would they behave? And then just try to amplify the things that are awesome about what you do, that's it. That's the job. Bailer : Well, money is being spent to do this, you know? Platt : Quite a bit. Bailer : So, how do you decide you've got a return on that investment? Platt : Yeah, I mean, the beauty of digital marketing as opposed to the world before digital marketing, is there's sort of a line there. But, it's that everything is measurable everything is measurable. I mean, not just like how many people come to your website or click on a link you - we know how long as you scroll through Facebook, how long do your eyes linger on something before you scroll. We know where your mouse moves on the page. If you don't log out of Facebook, like hit the logout button, Facebook knows every website that you go to everyday all day long, even though you're not on Facebook. Chrome knows these things. There are layers of interfaces within it and are tracking all of these things and, so I'm happy to talk about the "creepiness factor". But, there's a whole lot of that but it allows for very direct conversations about return on investment. I mean you can buy an ad on Facebook that says look, I only going to pay for this ad if someone clicks on the ad and actually buys my product, otherwise I don't get charged for the ad. And Facebook knows that they know that they've clicked on it they know that you've gone all the way through the checkout process and gone to that confirmation page, and when that little single pixel of invisible image that's pulled from the confirmation page tracks back to the fact that you were at that website, you as the company get charged for that ad. That's the level of attribution. Now, one of the big problems right now with marketers, this is called the "Attribution Problem" is it's easy to know if someone clicked on that ad and bought something, but if that person doesn't buy that thing for two or three days or months, then how do you know? How do you, sort of, attribute the search that they did to your Google search? Was it the Facebook ad? Was it their friends talking about it? How do you break apart? That's the attribution problem right now. And Procter & Gamble has totally upended digital marketing recently, by telling digital marketers they will no longer buy ads unless they can give them clear data on the attribution of those ads. So, like one company has upended digital marketing in the last year by demanding accountability along those attribution lines. Campbell: This is kind of like the problems in television ratings, when you can start recording shows, and then the networks worried that, "Well how do you know someone didn't record and watch it 3 days later?" And the accountability factor there, which you call an attribution is a problem. Platt : And in fact, for like YouTube this is - think of the parallel, this is a big deal because they want to sell ads, right? So, they're all about telling these companies, so yeah, your ads got seen and then it turns out, well, YouTube counted a watch, so someone only watched the ad if they only watched the first five seconds of the ad. So, it's like, "well, that's not really watching", so how many seconds is watching an ad? And how do we really know they were watching and didn't have another tab open? Because Chrome can tell you that but they're not reporting that. Campbell : So, talk more about the "Creepiness Factor". What we should be worried about? Because, I think this gets in to privacy issues, and people knowing stuff about us and we don't even know that they know. Platt: It does. The first day in my class where we have the students go through and actually buy a Facebook ad, they go up to the point to actually hit submit. But, they go through the process of buying one there's like this moment where a pin could drop in the class and they're like "Holy… How did they… How did they know this?" Right? When you start getting into that ad-buying platform, you come to realize what they're doing is not only doing this creepy tracking that I mentioned, but then they triangulate that right? They've got in, sort of database terms, there's key pieces of data that are connecting up to other data sets, so they are buying datasets about like political contributions, and they're buying datasets about your credit score. So, you can buy an ad to say, "I want to place an ad on Facebook that goes to women between the ages of 45 and 50, in this zip code, who have donated money to the Republican Party, have two kids, recently got married, have a credit score of 700 or higher, drive a Volvo, and tend to buy health food products". Easy. Like that's an easy one, you can even get far more complicated than that. So, there's massive amount of data that gets all triangulated to create this picture of who you are, and then ads are sold on it. Now, the story Facebook will tell you is this is, "This is how you don't get served useless ads". I don't know if you remember the early days of Facebook, where like women would get ads for shaving equipment? So you know, no one wants that, so on one had the idea that the platform could anticipate what you want, like retargeting, for example, which delivers an ad to you, based on a website that you've already been at we've all seen that where you're like "How did they know I was on Patagonia's site?" Like, it's because they were tracking that right, but if you were on Patagonia's site it's probably because you wanted to buy something from Patagonia so maybe seeing an ad isn't a bad thing, right? That's the pitch, the dark side of this is we know from the last presidential campaign, that this allows you to target ads based on race. It allows you to target ads based on all sorts of ideology, that you almost have to ask yourself just because we can do this doesn't mean that we should. 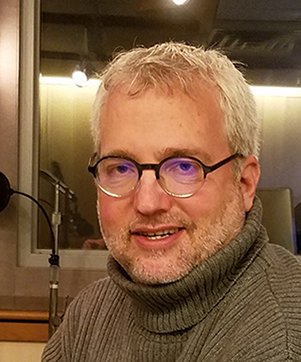 Pennington : You're listening to Stats and Stories and our discussion today is on digital marketing guest today is Glenn Platt director of the Armstrong Center for Interactive Media Studies at Miami university. So, Glenn, for someone who is concerned about this creepy tracking, I just noticed actually today that I had clicked through a site on Facebook, and then I opened my iPhone and there were ads for this site in my iPhone. I'm like, "How is this happening?" So how do you avoid having this kind of data collected? Do you just minimize your footprint digitally? Do you sign out of Facebook? How do you suggest, for people who don't want to turn around and see ads everywhere? Platt : Yeah, you know, let me just say one thing before answering this, because this question of whether or not this is valuable, like, I think the problem is that we're doing things because we have the data, but not because we know that that activity is going to be useful for the person. In other words, if you've ever seen an ad for something you've already bought, right? And you think, "Shouldn't they know this? Shouldn't they know I've bought this? And it's because they're not quite there. They know that they can give you an ad based on your … all this sort of private information but its not quite smart enough, and if its not quite smart enough it might as well not be there at all. Like it reminds me of - have you ever heard of the effect called the Uncanny Valley? About when you deal with virtual reality people but they're lifelike, and they're so almost lifelike that they are creepy as hell because that last little bit is the hard part. Like you'd much rather have a Pixar person who looks fake than like, what was that Tom Hanks train movie? Pennington : Polar Express? Or like that Princess Leia at the end of Rogue One? Platt : Oh, yeah right? Because its not quite there. It's the same thing with ads. These digital ads aren't quite anticipating our needs, they're close, they're in the ballpark, but because they are close and not there, that makes them far more annoying than if they weren't there to begin with. So now, to answer your questions about how you prevent this - like, I'm going to get all "tin foil hatty", okay, alright, like, because I have this weird love-hate relationship with this stuff, like I teach my students how to actually do these thigs, yet I have like 4 different VPNs on my laptop and my phone, I actually have a pouch I keep my phone in, that's a Faraday Cage pouch, because you can be tracked with your phone whether its turned off or on, it doesn't make a difference. The government can track you on it. I don't mean to sound like "the government's involved", like, they literally can. There's these stinger type things that give off fake cell phone tower pings and then they can figure out where you are, so why do I have it? Because I can. I think it's none of their business where I am, so things you can do, VPNs are the easy way to do it. VPNs are these days are super affordable. And a VPN is just like a tunnel for your Internet traffic. So, it takes all the things you do on the Internet and puts them through a pipe and it comes out on the other end. And that pipe could be in England. So, for example, if you have a VPN that's working out of England, you can watch the BBC i-player, things like that, or it could just be in Indiana, but either way it's not attributable to who you are. But, even VPNs, depending on your browser, your browser can still be tracking your activity. so, you should be using incognito mode, but even then, Chrome in incognito mode keeps track of certain things, that Opera, for example, in incognito mode doesn't. I mean if you really want to… This is a longer conversation, but if you want to kind of get off the grid, um Firefox is a good browser to use to keep yourself more privacy, especially the new version that just came out. You want to use VPNs, you want to be careful whenever you're on like, Starbucks, and public Internet sites, because it's easier to track the things you do. Then there's all sorts of things you can include on your browser that do ad blocking and that kind of thing, but let me now, sort of, "wear my conflicted hat", like, do you know how much it costs to run Facebook? Its billions of dollars a year, right? You know? Or newspapers that need to do their business, they don't just give away information, people don't work there for free. And so, there's something to be said for saying, "I'm willing to give up this privacy as my payment to use these things ostensibly, for free because I know they're not free, and becoming comfortable with that, managing your own privacy, that's the trick. I have this vision that someday were going to be like, I call them "chief marketing officers of ourself". Like, we should get rewarded for giving up our data. Like, I should get a check, you know, from Google. Because they're selling my data and making something. I should get a check for that, like, that's the kind of ultimate end game. Campbell : You brought up newspapers, so I'm going to ask you to put on your economist hat here, because we're living in this world and I worry about legacy media, especially newspapers. Where, we're in a world where the aggregators are getting all the money, right? So how do we, and this is a show about stats and stories, so stories are generally produced in journalism business by the reporters, but the greatest compensation is going to people that aggregate those stories. And our students today, we know they're probably the best-informed generation ever, they read newspapers, but not the hard copy. They read them online, and they usually get there between Facebook or Google. So, how do you think about this? And I know we're kind of at the beginning stages of the Internet. This is, as media go we really are, it's just a recent invention. So, I worry about newspapers, I worry about journalism in general, because these are folks who actually go out and give us real information, and do the documentation, when they're doing their job right, and we depend on them, so, should we be worried about this more than we are? Platt : There you go. I can have Christiane Amanpour do my voicemail message. For 500 dollars she'll do a voice mail message. I'm not saying she said that she'd do this, but that kind of model, right, finding these kinds of people who care about it are willing to pay for some special, maybe more intimate relationship with that news source, I think that's where things are headed. That we have these kinds of different tiered relationships with news media, that there's the common stuff, and then the special. Bailer You talked about the "creepiness factor" and the use of this data, but a lot of times when data is collected there are certain safeguards in place. When you're giving data in a medical context, there are laws in the government. There are laws that govern the access to data in University and educational contexts. I wonder are there ethical guidelines for marketing use of data? And if not, should there be? Bailer : Right there's no HIPAA for this. Platt : Right there's nothing like that. I am fairly sure that, of these marketing association have different ethical codes and standards that they've used, but the problem is that technology is changing way faster than you could ever have a committee get together and decide how you're going to legislate around it, right? I mean you can hope for some guiding principles, but, sadly… And "bad actors will behave badly" and do with this data, unfortunately. Platt : Thank you, appreciate you having me. Pennington : Stats and Stories is a partnership between Miami University's Statistics and Media Journalism and Film, and the American Statistical Association. You can follow us on Twitter or iTunes. If you'd like to share your thoughts on the program, send your email to statsandstories@miamioh.edu , and be sure to listen for future editions of Stats and Stories, where we discuss the statistics behind the stories, and the stories behind the statistics.